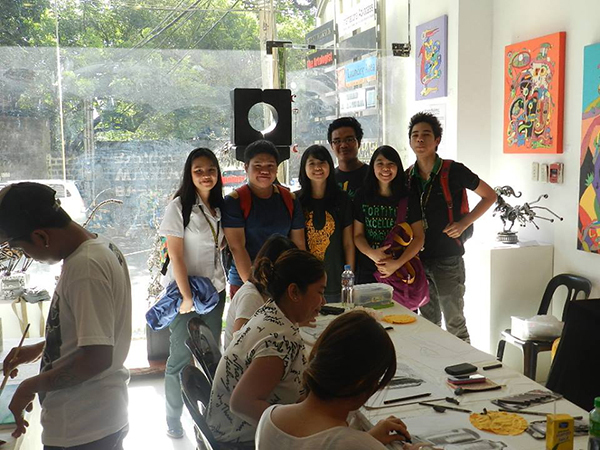 My daughter and her classmates had been invited to an art exhibit held in San Juan early this month. They may have difficulty locating the place, but the (brief) time spent at the exhibit was well worth it. They were welcomed by the one in charge at the gallery (or was it the gallery owner). Too bad the artist (who gave the invitation) was not around at the time to tell more about his work. Nevertheless, the students enjoyed the art exhibit and still have the energy to print business cards online for their project. This entry was posted in Places to visit and tagged art exhibit, monar baldemor on March 24, 2014 by Yami. How many times have you been to Baguio? Do you have plans of going back to the summer capital when the school year is over? I would love to spend summer in Baguio. The last time I went there was in the early part of 2000 to attend a health workshop. The health reporters from various newspaper organizations were billeted in a hotel. We were there for a couple of days but we were not at liberty to roam around the city due to the workshop’s tight schedule. The only time we were able to buy pasalubong was on the last day of the workshop. And the pasalubong items were even bought at the hotel lobby. If given a chance I would love to go back to Baguio. There’s so much in Baguio that I want to explore. Maybe a side trip to Benguet and Sagada would also be a good idea. I’ve heard and read so much about these places and I want to witness the natural wonders and beauty that I can only admire through photographs. Various reviews online will surely help me find inexpensive cottages to accommodate me and my family for a few days while we are in the summer capital. I just wish my husband will be more open-minded when it comes to the idea of traveling as a family. This entry was posted in Tourists destination and tagged summer capital of the Philippines, summer destination, summer vacation, vacation destination on March 12, 2014 by Yami. 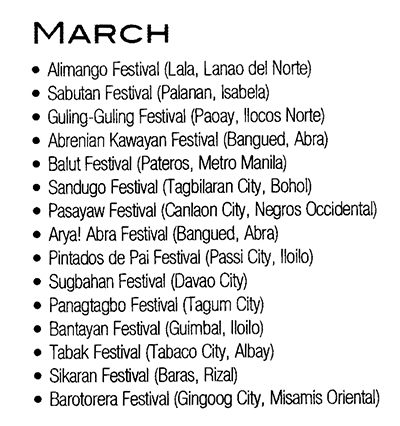 Please take note of the following festivals observed in various places in the Philippines for the month of March. This entry was posted in Festivals and tagged festival, festivals in the philippines, fiesta, fiesta for the month of march on March 11, 2014 by Yami.